RAM: 8GB 2133mhz Kingston Hyper X. Alienware Aurora R4 Desktop. Motherboard: Alienware Aurora R4. Case: Alienware Aurora ALX with RGB lighting and active vents. GPU: EVGA GTX 970 Superclocked. Other than that, everything works perfectly. Alienware Aurora PC Desktop - Customised. Condition is Used. Have no memory, hard disk and video card . Working order with i7 second generation. Sale because of a upgrade. Colection only, or local delivery available. Alienware Alpha - Console Sized Gaming Desktop PC - i7 4765T - 8GB Ram - 1TB . Condition is Used. With original box and steam controller. Has been set up with windows 10 so that more games can be played on it. Condition good Used. with lighting board fans. Here we have an Alienware Area 51 ALX. This will sold as a. Alienware Area 51 ALX. The Alienware LED lights are connected to (and managed by) a separate I/O board at the bottom of the case. If you are planning to upgrade the motherboard, you can install any motherboard you wish but if you intend to retain the light functionality you will have to modify the 10-pin connector that powers the I/O board itself. Condition is Used. Windows 10 installed. 1GB GDDR5 NVIDIA GeForce GTX 555. Alienware Active Venting (Height with top vents open: 17.59" (447mm)). Alienware Command Center. Alienware™ High-Performance CPU Liquid Cooling. 4x 240-Pin DDR3 SDRAM Slots. Due to the graphic cards installed you have plenty connectivity options for multiple screens and also plenty of usb connections. The overall condition of the case is very good and it has hardly any scratches. It is working fine. I am using with this computer for my computing course. Doing programming and staff. There are lots of dust, scratches. Original box and manual missing. Just the desktop only. Alienware Area 51 Gaming Computer. Nvidia GeForce GTX 295 (1792MB) Graphics Card Discrete Graphics, Windows 10 Pro. No other item is included (just the PC base unit only). COLLECTION ONLY. Not included (for display purposes only). Genuine Alienware product. 500GB hard disk. 4GB DDR3 SDRAM (1 spare slot). Model: Alpha. Alpha computer unit. Windows 10 installed (clean install). Here for sale is a powerful Alienware X51 R2 which was originally bought for over £1,000 and has since been upgraded for CAD spec use in an architectural studio. ALIENWARE X51 R2. 256GB SSD 2TB SATA Storage Hard Disk Drives. DELL ALIENWARE Aurora R7 I7 8700, 8GB NVIDIA GTX 1060, 1TB HD 240GB SSD. Tray load DVD Drive (Reads and Writes to DVD/CD) 8GB (1x8GB) 2666MHz DDR4 Non- ECC Thermal Heatsink Fan for Air Cooling CPU, 65W Software Drivers (No Media) Dell USB Optical Mouse - Black Dell Wireless 1820 Card (802.11AC Dual-Band Wi-Fi Bluetooth 4.1) 1 TB SATA3 512E Hard Drive (7200RPM) 240gb ssd Power Cord : 250V Dell 105 Key USB Keyboard Black NVIDIA GeForce GTX 1060 with 6GB GDDR5 Windows 10 Home (64bit) Processor: Intel® Core™ i7-8700 (6 Core, 3.2 GHz, 12MB Cache, 65W) As new in original box. Only turned on twice and had no use hence the sale. Any questions do not hesitate to ask. Runs most demanding games in medium settings. Please check pictures of the items. Following are included in sale: 1× Alienware Alpha Core i3 4GB RAM 120GB SSD Nvidia Graphics 1x Power brick 1x HDMI cable 1x Wireless controller 1x Creative Pebble speaker (great audio quality) 1x Gaming Mouse 1x Backlit gaming keyboard 1x Bluetooth Headset This is a brilliant little media PC way much better than most NUC,s compact PC. NVIDIA® GeForce® GTX 1070 with 8GB GDDR5. 1TB SATA Hard Drive (7200 RPM). Alienware Aurora R7. 16GB DDR4 2666MHz (2x8GB) N-ECC. Tower : Alienware™ Air Cooling. Inspired by the thermal ergonomics of the Area-51, the Aurora provides optimal air intake on the front and right panels and an exhaust fan on top for maximum airflow and cooling of internal components. Here is my Aurora R7. I bought it last year and it's hardly been used. It's a high spec gaming PC at a very good price. Clean working alienware desktop with ssd and 8gb ram @ 1600mgz. with nvidia GTX 760 2gb. fortnite gta others. DOES NOT INCLUDE MONITOR. MOUSE OR KEYBOARD. Here for sale is a powerful Alienware X51 R2 which was originally bought for around £1,000. ALIENWARE X51 R2. Alienware Command Centre 4.0; AlienFX customisable lighting. SPDIF TOSlink RCA Digital, RJ45 Gigabit Ethernet Network and HDMi rear outputs. For sale Alienware X51 desktop pc with 23" monitor, keyboard and mouse, in very good condition, clean, not much used. DVD eject button works as it should. OS: Windows 7 (with Alienware Windows 7 64 bit DVD). Here for sale is a powerful Alienware X51 which was originally bought for around £1,000. ALIENWARE X51. 240GB SSD 1TB Hard Disk Drives. Alienware Command Centre 4.0; AlienFX customisable lighting. Here for sale is a powerful Alienware X51 R2 which was originally bought for around £1,000. ALIENWARE X51 R2. 2TB Hard Disk Drive. Alienware Command Centre 4.0; AlienFX customisable lighting. 16GB 1600MHz DDR3 RAM. This PC is great in general. The best feature about this PC is that it has a quad 3Ghz i5 3330 processor, 3.3 at boost, it has a blu ray optical drive and the graphics card is a GT 730 2gb with 8gb of new ram. DOES NOT INCLUDE MONITOR, MOUSE or keyboard. Clean very nice alienware mini desk top. 16gb, ssd fast, and with 4gb nvidia gtx 745 . You know X51. The stakes are high and the new X51 R2 will make you better equipped to compete. Dell Alienware x51 R2. High-end Gigabyte Nvidia GeForce GTX 1050 Ti Windforce OC 4GB GDDR5. 120 GB SSD Primary Storage Upgraded. Very Fast Computer. Good for gaming and Designs. 32GB DDR4 RAM. 256 SSD And 1TB HDD. 16GB DDR4 RAM,1 TB SATA3 Hard Drive. Alienware Aurora R7 Gaming PC. PC Type Alienware Aurora R7 Gaming PC UK Spec. 8GB GDDR5X NVIDIA GeForce GTX 1070 Graphics. Graphic Card 8GB GDDR5X NVIDIA GeForce GTX 1070 Graphics. Alienware Alpha Intel Core i7, Windows 10, Gaming PC. Please Read Description. Model - Alienware X51. if you prefer to use the GTX 660 graphics card install msi afterburner to prevent any issues with the GTX 660. When using the GTX 660 graphics card install MSi afterburner if you do delete this user account and create a new one. 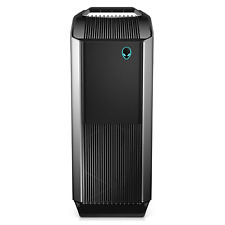 FACTORY Dell Alienware Area 51 R5 i9-7900X 4.30GHZ Dual 8GB RTX 2080 Geforce OC 3TB SSD 32GB, Centauri 15000w Chasis. FACTORY DELL ALIENWARE AREA 51 R5 I9-7900X 4.30GHZ DUAL 8GB RTX 2080 GEFORCE OC 3TB SSD 32GB. Condition is Used. Alienware R5 Tower specs-. Alienware 01NYPT (U3E1) motherboard. Silver tray pc desk used. Kensington orbit mouse. Dell keyboard. Technical monitor/tv 32" (1 screw missing out of the stand for the tv/monitor) still works perfectly. NVIDIA® GeForce® GTX 1080 with 8GB GDDR5X. 1TB SATA Hard Drive (7200 RPM). Alienware Aurora R7. 8GB (1x8GB) 2667MHz SDRAM DDR4 Non-ECC. Tower : Alienware™ Liquid Cooling System. Inspired by the thermal ergonomics of the Area-51, the Aurora provides optimal air intake on the front and right panels and an exhaust fan on top for maximum airflow and cooling of internal components. Here for sale is a powerful Alienware X51 R2 which was originally bought for around £1,000. ALIENWARE X51 R2. 256GB SSD 2TB SATA Storage Hard Disk Drive. Alienware Command Centre 4.0; AlienFX customisable lighting. DOES NOT INCLUDE MOUSE, MONITOR . AMD Radeon R9 graphics. 256GB SSD - Solid State Drive. The Coral R2 is user-accessible, making it simple to upgrade the CPU and RAM when you need even more performance. Storage: 256 GB SSD. The units carry a 3 Months Warranty for Peace of Mind. Intel Core i7 Extreme 6th Gen.